Fibre-in-a-Box with four six, eight and 12 core. KRONE Australia has announced the arrival of Fibre-in-a-Box, a new system designed to save contractor's time and help streamline cable installation. Developed for ease-of-use, Fibre-in-a-Box features metre markings, easy glide reel system, generous cable exit point and reinforced carry point. The compact design is also easily transported between sites. Fibre-in-a-Box is available in core counts of four, six, eight and 12 core multimode 62.5/125μm general purpose (GP) cable. For maximum yield the length of cable differs according to core count. The four core and six core GP Fibre-in-a-Box measures 500m, eight core GP Fibre-in-a-Box is 400m and 12 core GP Fibre-in-a-Box is 320m. 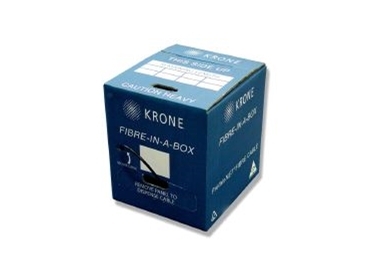 Fibre-in-a-Box compliments KRONE's range of HIGHLIGHT fibre cable products.